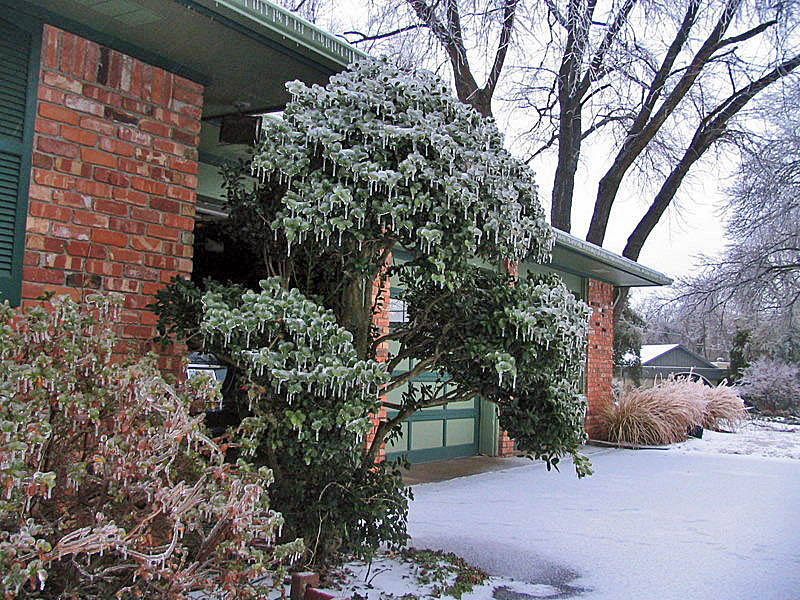 Ice storm. Two little words that I’ve come to respect (and fear) since the big one that hit us in December 2007. When the weather gurus forecast another this past week, we braced ourselves in preparation. Groceries, candles, firewood, cash… and indeed, it arrived. We’re now locked inside, with two happy dogs who don’t quite understand why they can stay in the house all day, snoozing in the comfort of their beds. At least, the 2010 version didn’t disrupt our power, so the fire in our fireplace is for pleasure, not necessity. This weather calls for comfort food! For the first icy evening, I prepared a recipe from the latest Fine Cooking, described therein as “elegant enough for entertaining, but simple enough to make anytime.” It calls for a cut-up chicken, but I used packaged chicken thighs instead, which are so under-appreciated and inexpensive, but so full of flavor! Blot the chicken absolutely dry with a paper towel before you begin, then season it on all sides with salt and pepper. Cut the ends off the lemon, stand it on one end, carefully peel it, and release the lemon segments from the membranes, dropping them in a small bowl. Cut the segments in two or three pieces. Heat the butter and the oil in a large skillet over medium-high heat. Working in batches if necessary, cook the chicken skin side down until golden-brown, 5 to 6 minutes. 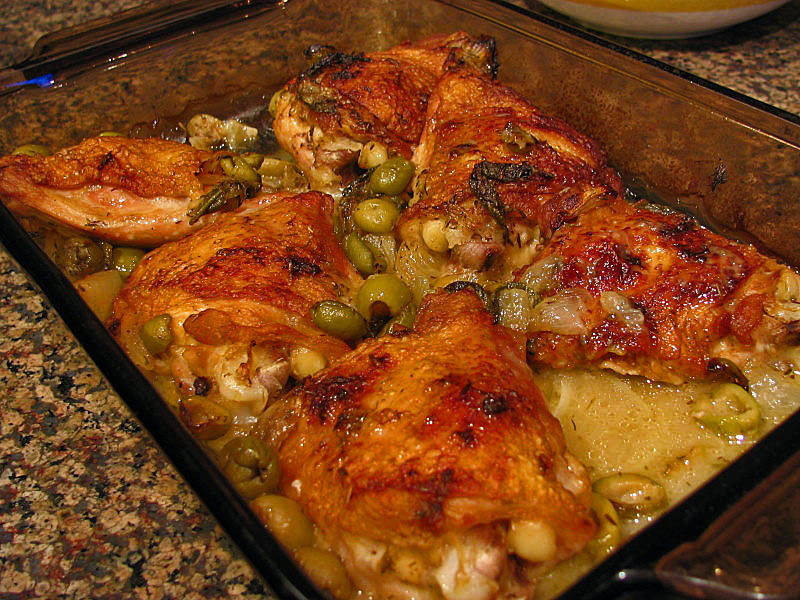 Transfer the chicken to a baking dish with the browned side up. Pour off all but 2 Tbs. of the fat. Add the shallots, olives, sage, bay leaves, thyme sprigs, and lemon segments, and cook for a couple of minutes. Add the lemony sauce to the roasting pan; cover with aluminum foil. Bake for 45 minutes, then remove the foil and increase the heat to 400F for 10 minutes to ensure the skin is crisp (alternatively, run the roasting pan under the broiler for a few minutes). Comments: The original recipe “pan-roasts” the chicken. That is, after browning the skin and sauteing the flavor ingredients, the chicken is returned to the pan and placed in a high temperature oven (450F) for 18-20 minutes, or until the meat reached 165F. I’ve cooked chicken this way before and was always disappointed by the results. The high heat toughens the meat, blocking the juicy texture that I enjoy, especially in the thighs. I adapted the recipe for slow-roasting, almost a braise, as covering the pan with foil created the perfect environment. Pasta dressed with the lemony sauce from the slow-roasting was an excellent side for this dish, that made us forget the icy evening outside. This is a “Perfect Sunday Dinner“, even if the only ice you want to melt is that of a first dinner at home with a special date. Variations to try: we felt that mushrooms will nicely complement the dish, so next time I’m definitely adding some. 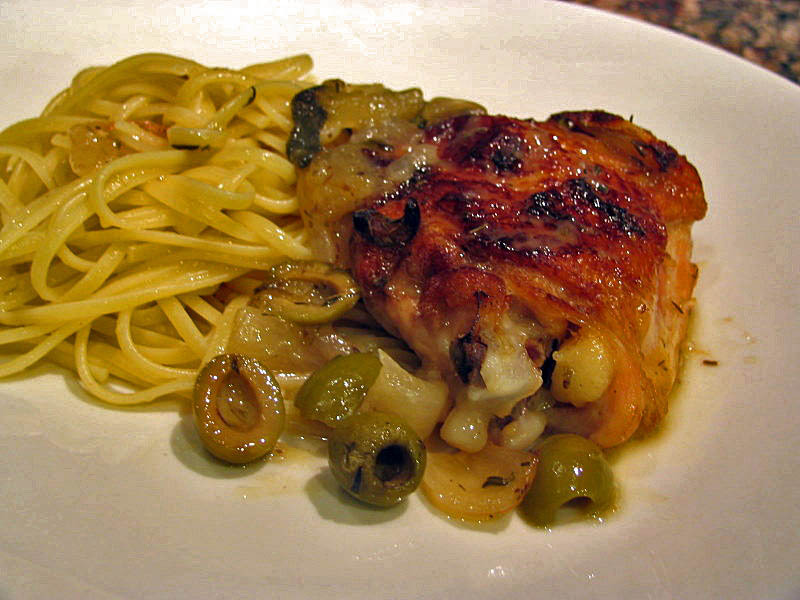 Reducing the amount of olives and substituting some capers could work too. To get in this proper dessert spirit, I’ll share my favorite recipe for flourless chocolate cake. Even someone as cake-challenged as myself can make this scrumptious dessert, as I have since I saw it on “Taste”, with David Rosengarten (back when the FoodTV Network was worth watching). I didn’t miss many of David’s shows, that I taped on my old VCR, and still have the box of those tapes. VCRs are a thing of the past, but one day I’ll digitize those shows on DVDs (…one happy day… right after I organize my recipes in beautiful, indexed folders). 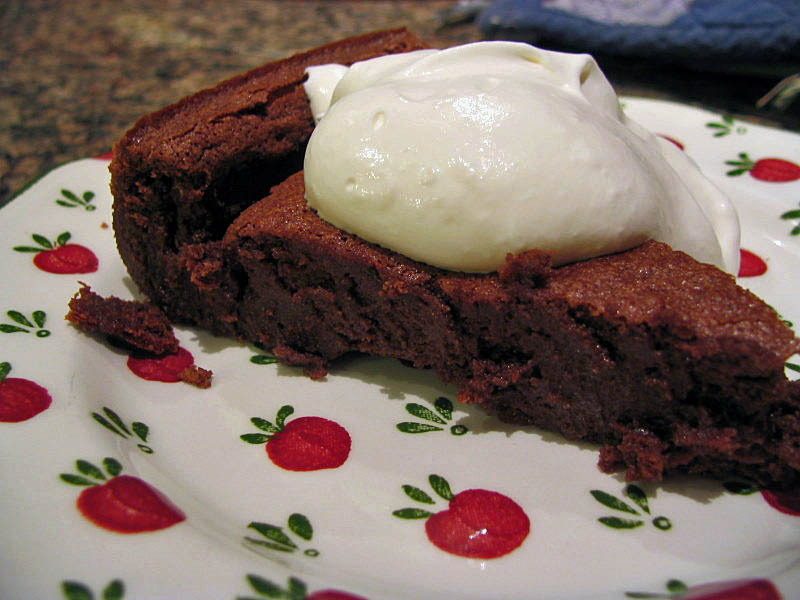 David Rosengarten’s flourless chocolate cake is special. I mean, who doesn’t like a pony? Even if you’re not a chocoholic, this dessert might be for you, but if you love chocolate, then don’t let this recipe pass you by. It’s dreamy with a little whipped cream on the side, that slightly mellows its potent chocolate kick. Please, use the best chocolate that you can find, because here quality makes a difference: the chocolate is all that you will taste. Heat the oven to 350F. Grease a 10-inch springform pan. Combine the chocolate and butter in a double boiler over simmering water, heating until fully melted and smooth. 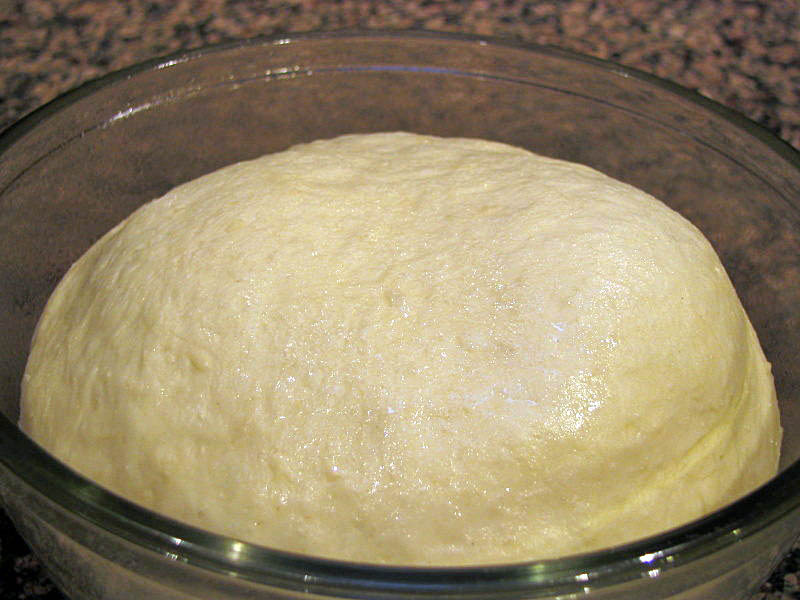 Transfer to a bowl, let it cool slightly for a few minutes, and whisk in the egg yolks and vanilla. Sift in the sugar, salt, and cocoa powder, while constantly stirring. Whip the egg whites to soft peaks. Gently mix about one third of them into the chocolate mixture, fold the remaining whites trying to deflate them as little as possible. Pour the mixture into the prepared springform pan. 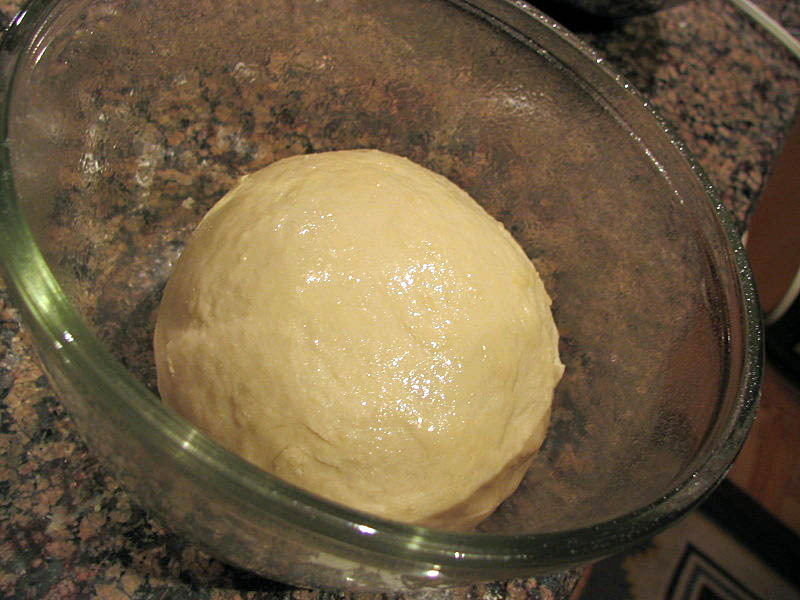 Place in the lower rack of the oven and bake for 25-28 minutes. 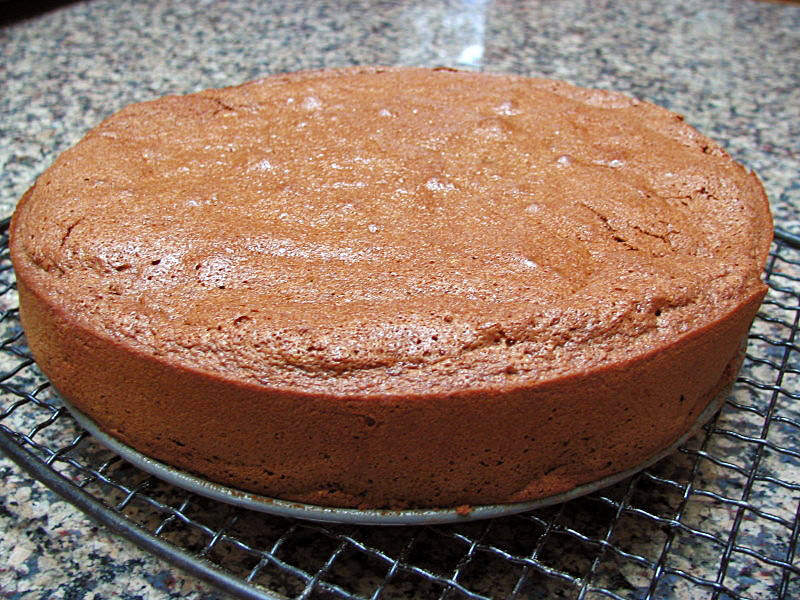 Remove the cake to a rack and immediately loosen the sides of the pan. Allow the cake to cool before serving. David’s original recipe instructed to press the cake down with a plate or other appropriate flat object right after removing the ring, to compress it and release a bit of the air produced by the whipped egg whites. In his opinion, the cake is all about a fudgy, dense, chocolaty texture. I’ve tried it both ways, and prefer to skip the compression, allowing it to naturally cool and deflate. For the fans of his show, those who certainly still remember his closing line…. Before starting the BBA Challenge I browsed the book to see what I was getting into. Two breads seemed most intimidating: Poilane, for obvious reasons, and Tuscan, for less obvious, but still relevant reasons. 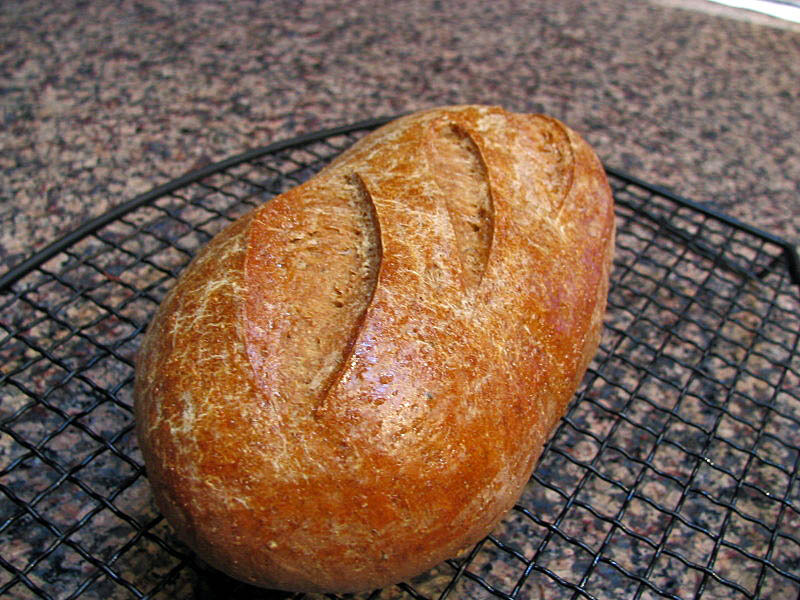 Tuscan bread is a traditional Italian loaf made without salt. Yes, that’s it, no salt whatsoever. The idea is downright scary. 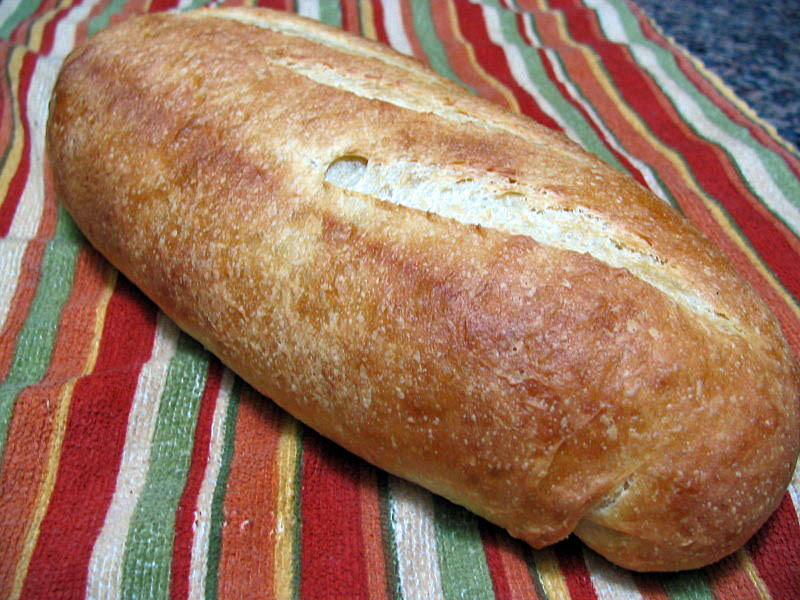 If you ever baked a bread and forgot to add the salt, then you know what I’m talking about. As far as its looks are concerned, the Tuscan loaf did not disappoint. I don’t know how to soften it, so here’s my verdict: this bread was tasteless. I tried it with olive oil + salt, with butter + salt, and with jam, and I didn’t enjoy it either way. On the other hand, my husband, who’s not a salt addict, actually liked the bread quite a bit in a peanut butter and jelly sandwich. His comment was that the strong flavor of the peanut butter was good with the sweetness of the bread. I spotted this gem on Fer’s blog, Chucrute com Salsicha (so, those who want the recipe in Portuguese can get it clicking here), and I’m delighted that a decade didn’t pass before I tried it! Make the dressing by adding the minced shallot, mustard and vinegar to the serving bowl. 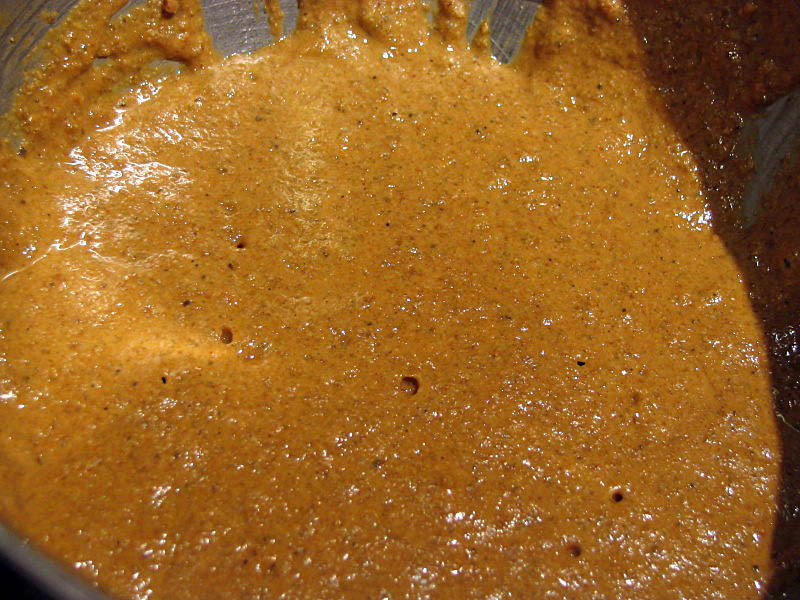 Mix well and slowly add the olive oil, constantly whisking to form an emulsion. Season with salt and pepper, then taste the dressing and adjust seasoning as needed. Grate the apples and add them to the dressing, mix well. 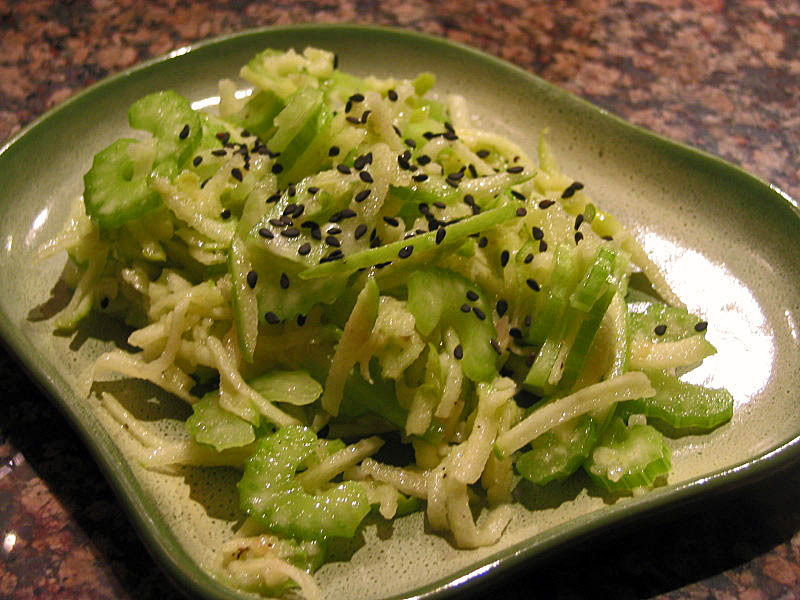 Add the celery, mix, and sprinkle sesame seeds on top just before serving. Comments: Champagne vinegar isn’t easy to find, but it’s worth searching for. It has a mild flavor and low acidity, perfect for dressing a simple salad. Following Fer’s suggestion, I didn’t peel the apples, just passed them through the grating disk of my food processor, and then changed the disk to slice the celery. Of course, if you are feeling particularly ambitious you can also grate and slice by hand. Black sesame seeds add a festive note of contrast that I love. Note to self: For a dinner party, this salad will be nice served inside raddichio leaves, for contrasting color and texture. Nigella seeds or cocoa nibs might top the salad equally well. For the past 5 years, my list of “New Year Resolutions” always began with the statement: “No cookbooks this year.” I usually managed to stick with it for a few months, until about March, which was no small feat considering that January and February constitute almost 60 days! Believe it or not, I won a cookbook! Last November Carol, from Alinea at Home, launched a fundraiser for “Share Our Strength”, and six of her lucky readers were rewarded with a cookbook – including me (a hopeless cookbook-addict!). 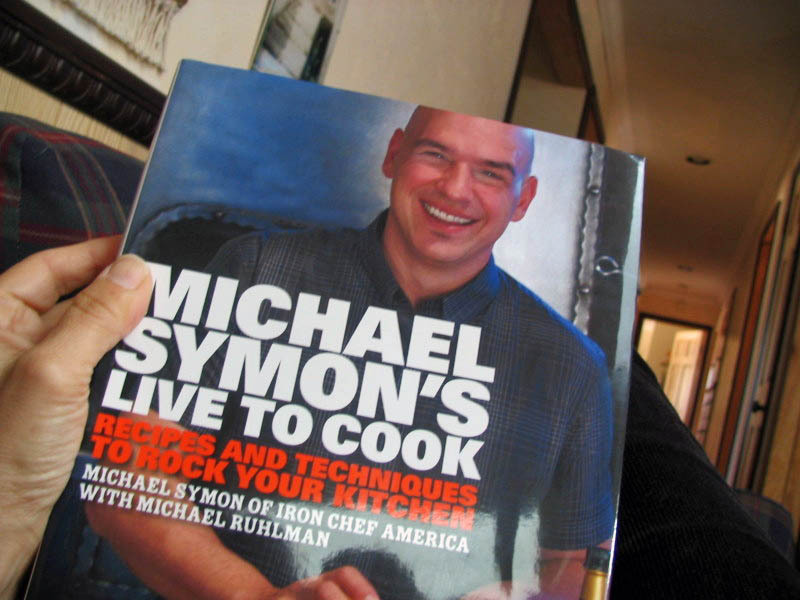 My prize was “Live to Cook,” by Michael Symon, the hugely popular chef from Cleveland, written together with Michael Ruhlman. I’d already heard a lot of praise for the book, and I could hardly wait to enjoy it! Carol’s note, “You will love to cook from it!” was right on. This cookbook is instantly exciting, because it’s more than a collection of recipes. Michael shares his “food memories,” the experiences that helped him become the chef he is today. Cooking seasonally and using the best ingredients is just the beginning. Every recipe has a story behind it, often family tales, but also plenty about his professional career. Basically, it’s my favorite kind of cookbook. Of course, I made something right away! 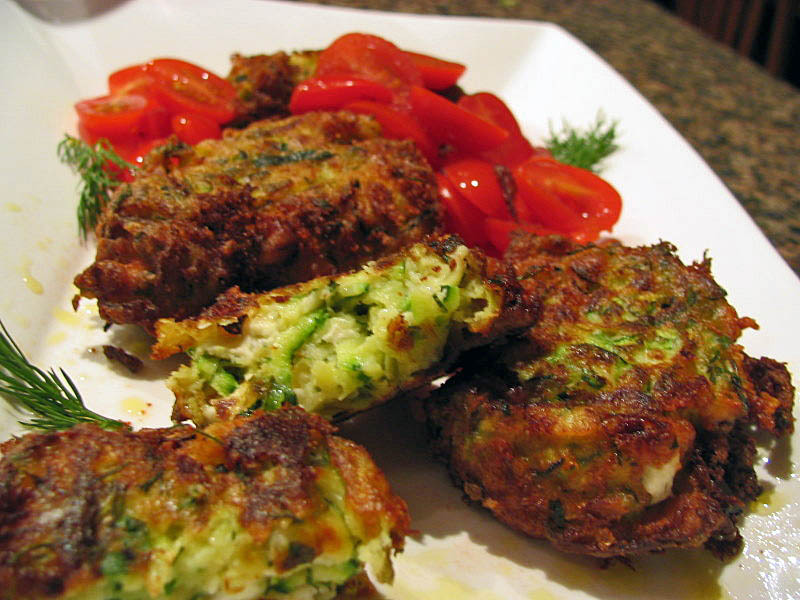 His zucchini fritters caught my attention because I had both zucchini and feta cheese in the fridge. They were simple to prepare and delicious! Cut off the ends of the zucchini and grate them using the large holes of a grater, right over a kitchen towel. Sprinkle the kosher salt on top, twist the towel around it, and place it inside a bowl while you prepare the rest of the ingredients (a lot of liquid will drain from the zucchini). Place the feta cheese in another bowl, add the dill, garlic, green onion, black pepper and the lemon zest. Squeeze the zucchini by twisting the towel around it over the sink until all liquid is released. Add the zucchini to the bowl, mix well, and add the egg and flour, mixing until fully combined. Heat enough oil in a frying pan to reach 1/4 inch height. Form small fritters using 1/4 cup measure (or eye-ball it). Cook the first side until brown before flipping the fritters over. Drain on paper towels. Transfer the fritters to a serving platter. Garnish with yogurt sauce if you want (I omitted this step and served them plain), surrounded by small grape tomatoes and fresh dill). Corte as extremidades das abobrinhas e rale sobre um pano de prato. Polvilhe com o sal, envolva com o pano, e coloque em uma tigela enquanto você prepara o resto dos ingredientes (uma boa quantidade de liquido vai escorrer da abobrinha). Coloque o queijo feta em outra tigela, acrescente o endro, alho, cebolinha, pimenta do reino e as raspas de limão. Esprema bem a abobrinha torcendo o pano, ate’ que todo o liquido seja eliminado. Adicione a abobrinha na tigela, misture bem e acrescente o ovo e a farinha, mexendo até ficar bem incorporado. Aqueça óleo em uma frigideira; forme pequenos bolinhos com cerca de 1/4 de xicara da mistura de abobrinha, ou com a quantidade que voce preferir. Cozinhe o primeiro lado até que fique bem dourado antes de fritar o segundo lado. Escorra em papel absorvente. Transfira os bolinhos para o prato em que serao servidos. Sirva com molho de iogurte se quiser; eu preferi omitir o molho, e servi rodeado de tomates-cereja e raminhos de endro. 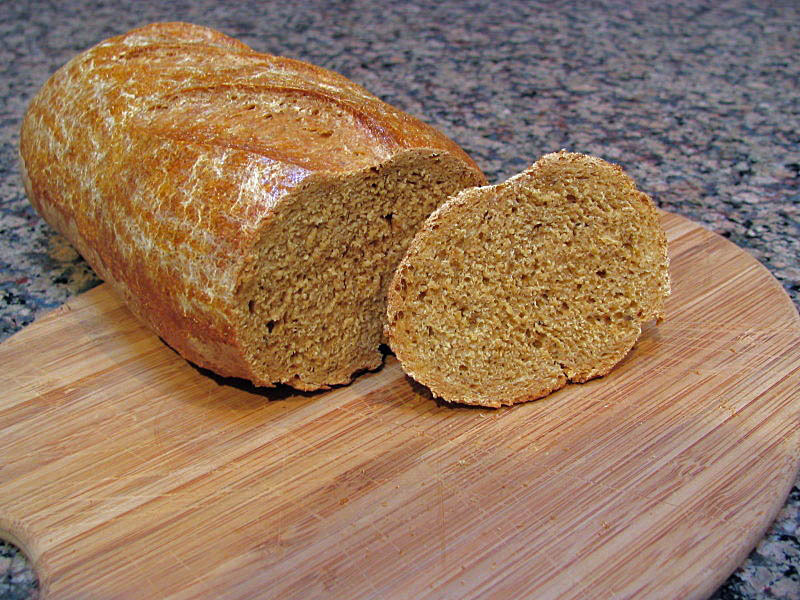 Following the Bread Baker’s Apprentice Challenge, we arrive at yet another sourdough rye, Swedish Limpa. The recipe required a special kind of “sponge” : a sourdough starter with molasses, spices (caraway and fennel seeds) and orange peel, that smelled terrific! 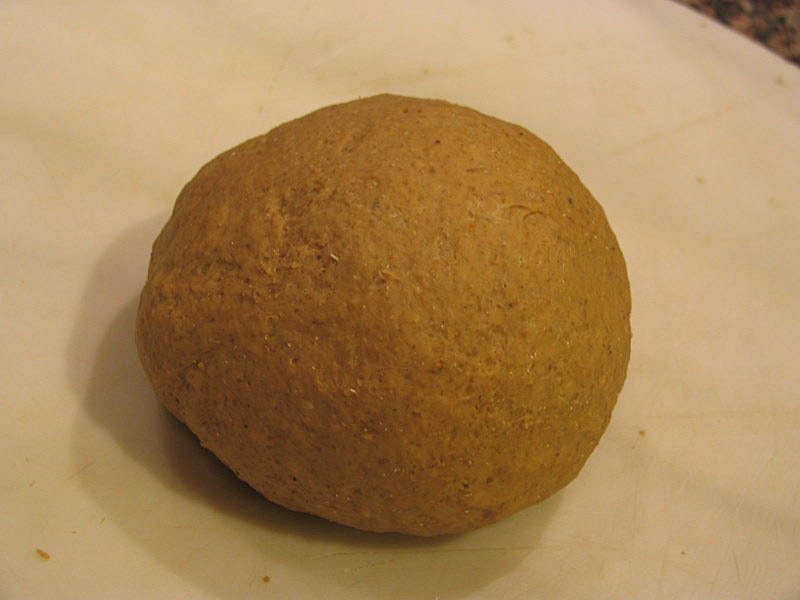 Apart from the fact that I dislike the “feel” of rye dough, I had no problems with the recipe. 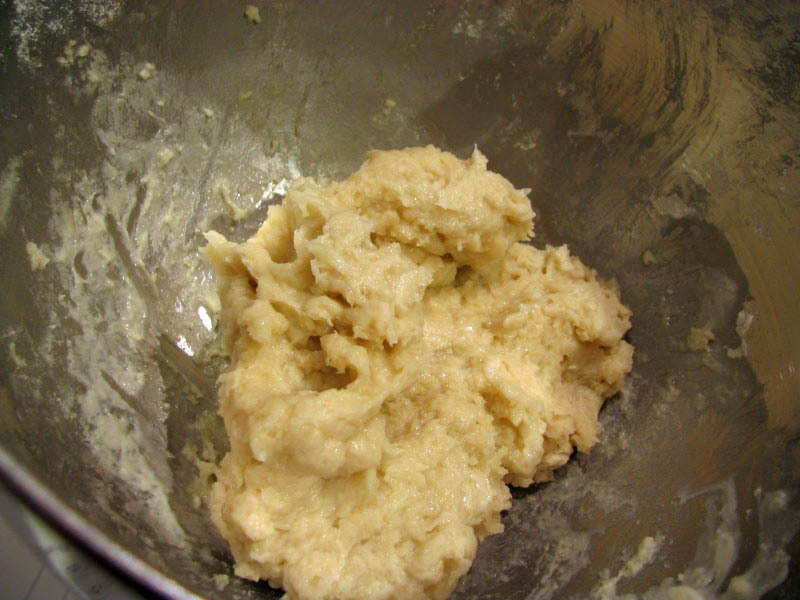 Here’s what the sponge looked like 60 minutes after mixing it…. 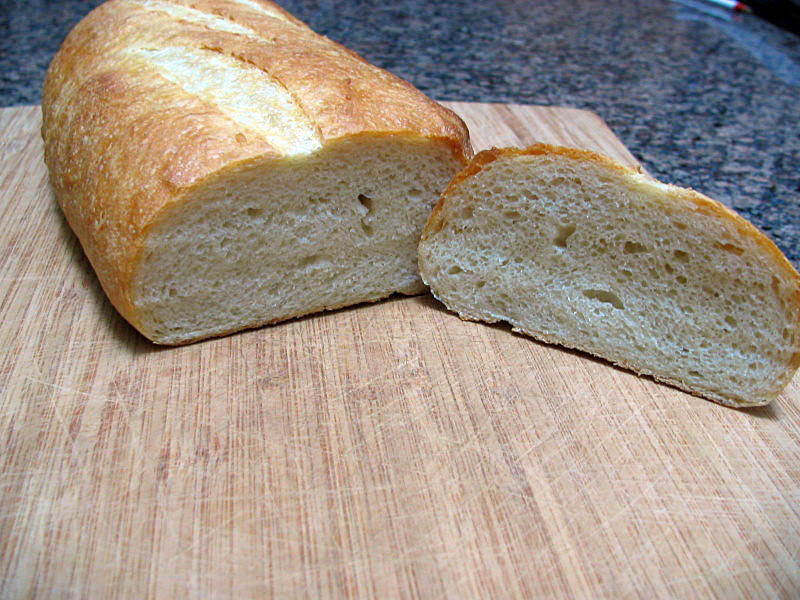 This bread smelled wonderful during baking, and the resulting crumb was tight and dense, but not too heavy. 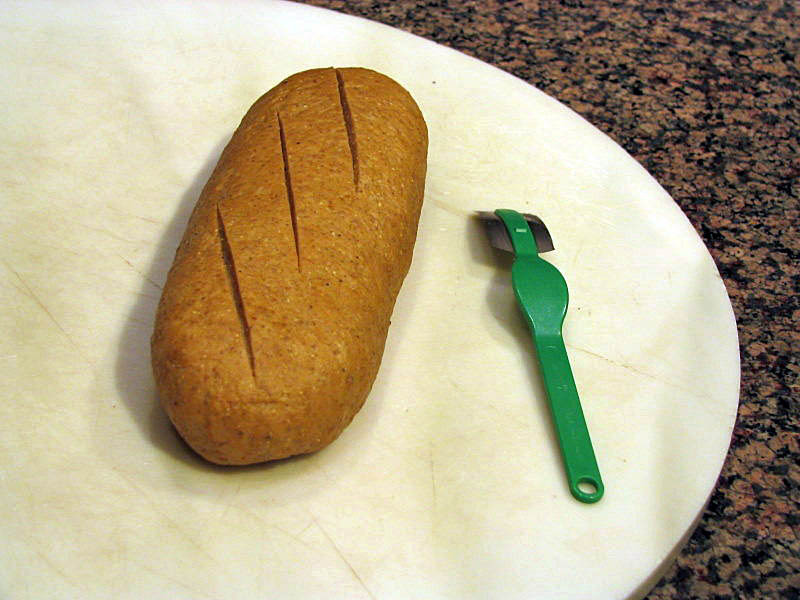 Verdict: it was a delicious bread, and impossible to eat only a single slice. Maybe it was the spices in the background, or the mix of molasses and rye that produced kind of a hippie-aura, but both me and my husband felt closer to Nirvana with each bite. 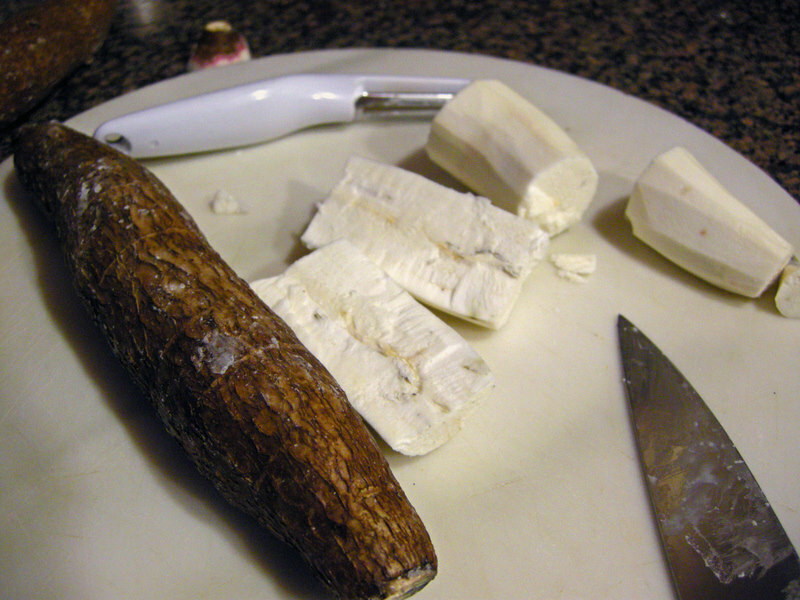 I suspect that many people have never tried it, and that those who saw manioc root for sale didn’t take it home, because it looks too strange and intimidating. That’s all quite sad, because it means they’re missing this: the Brazilian version of french fries. For many Brazilians, “mandioca frita” is even better than french fries. I know, it sounds heretical, but trust me – once you try it you will be hooked. Crunchy outside, creamy inside, with a flavor that can only be described as addictive. I won’t lie to you, mandioca frita takes some effort. But if you follow my instructions you won’t regret it. 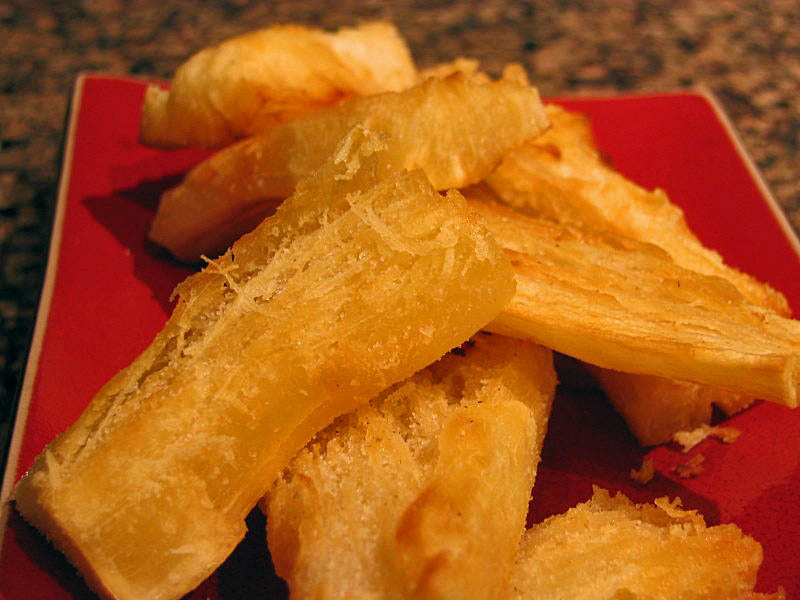 Manioc, also known as cassava and yucca, is a major ingredient in many cuisines of the world. You can read all about it here. 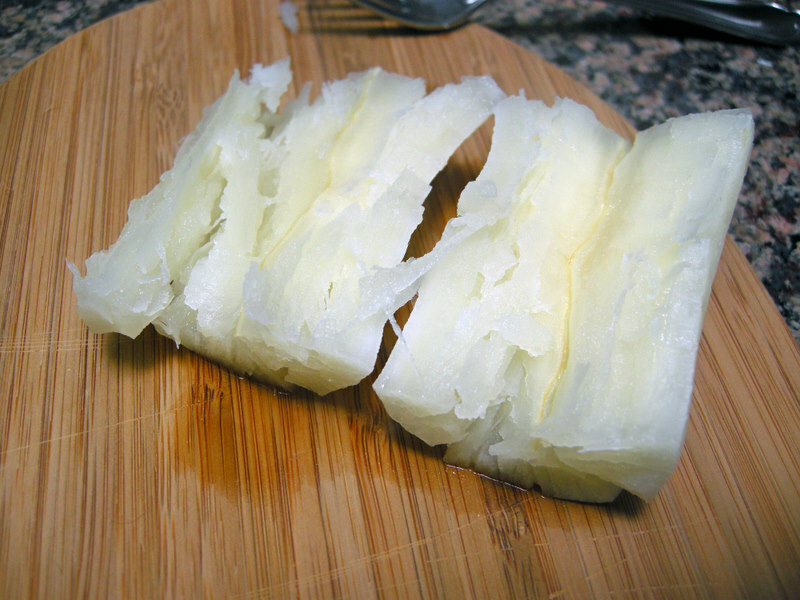 To cook the manioc, you first must peel it, a task that requires a good quality veggie peeler. The root is often sold covered with a thin layer of paraffin, but don’t worry about it, just peel the brown skin to reveal the white root underneath (Don’t even consider feeding the peel to your garbage disposal – you’ve been warned!). 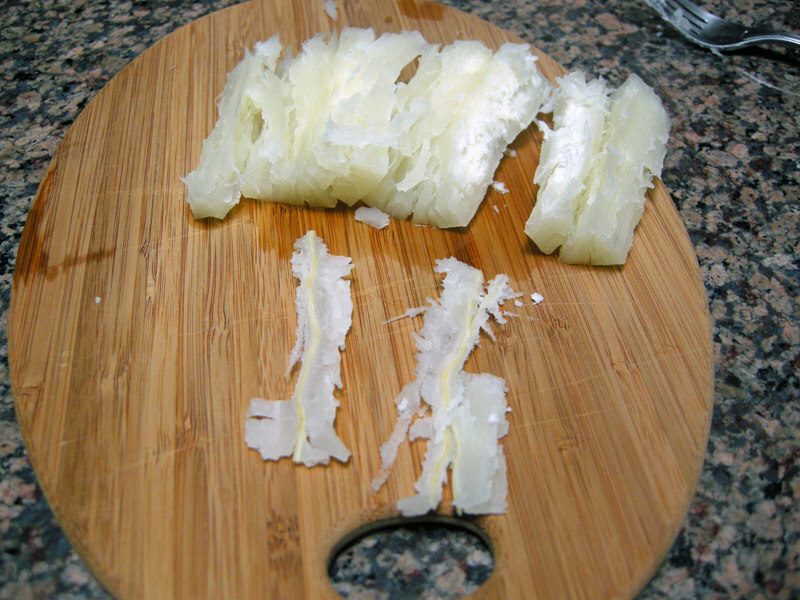 Next, using a big, sharp knife and some caution cut it into pieces: it’s a reasonably tough root…. … now you’re ready to begin cooking. 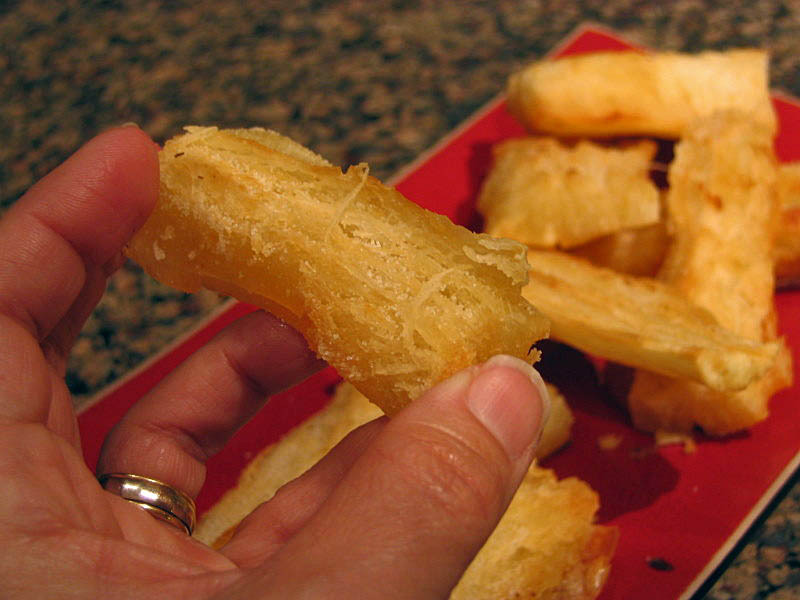 Fill a large pan with slightly salted water, and place the pieces of manioc inside. Bring it to a boil, reduce the heat and allow the pieces to cook until they’re tender, easily pierced with a fork (the time is somewhat unpredictable, anywhere from 25 to 50 minutes). Some pieces might burst open; just remove them from the water. In this photo you can see what they look like when ready. Once you cook it, you’ll notice a tough “string” in the very center of the root: remove it before frying. It’s too tough to eat, although it won’t hurt you if you don’t remove it. 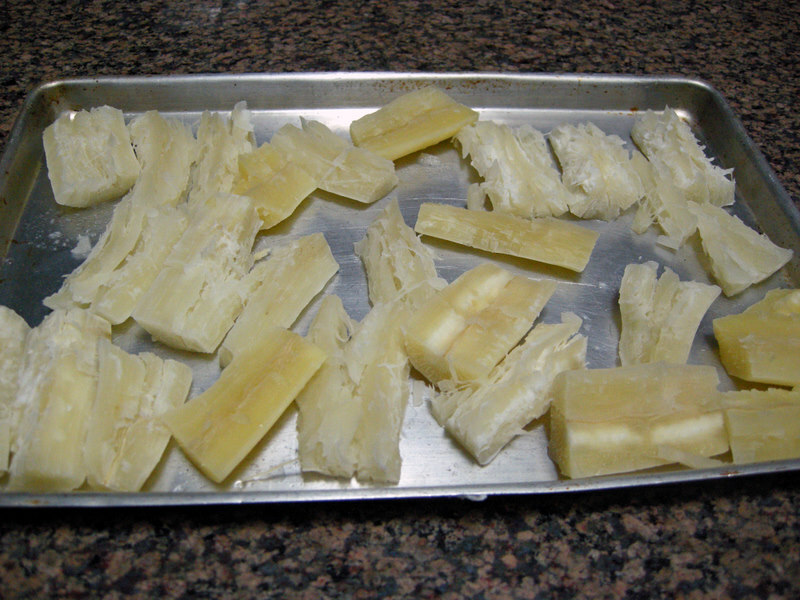 Here in the US I’ve found excellent manioc root in Asian markets, but as you can see from the next photo, in the same batch I had a mixture of varieties (white and yellow), something that never happens in Brazil, because they would be sold separately. Their taste is almost identical, although in my family you might witness heated discussions defending the qualities of one kind over another. To avoid taking sides, I pledge endless love for both. At this point you can fry them right away or save them for later. I normally cook a large batch, fry as many as we want for dinner, and then freeze the rest. 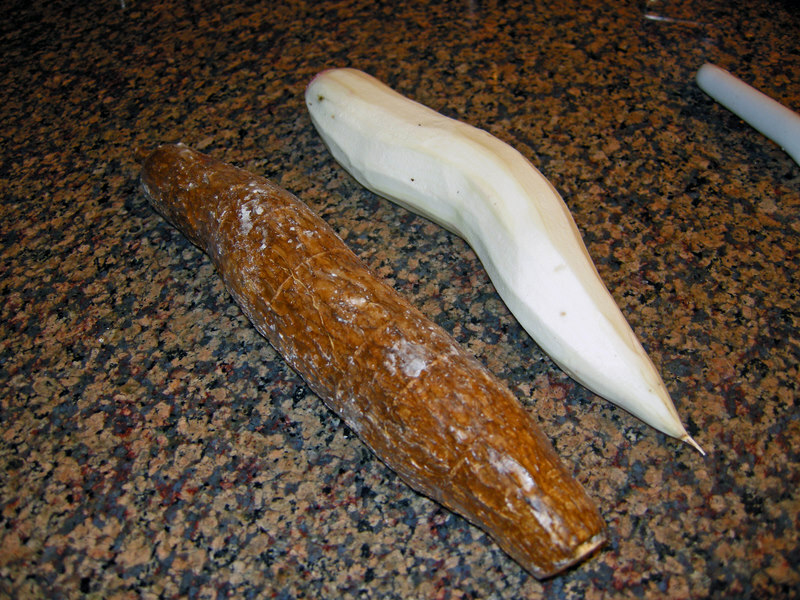 If you have a vac-saver system, you can use it to store the cooked manioc root. When you want to fry them, simply remove from the freezer and let them sit for half an hour; no need to even completely defrost them, although I wouldn’t go straight from frozen into the hot oil. To fry the cooked pieces, add 1/2 inch of vegetable oil to a large skillet and heat it until the manioc sizzles when it touches the oil. Fry as many pieces as will fit without crowding, and allow the first side to brown before moving them around, or they’ll get a bit greasy. 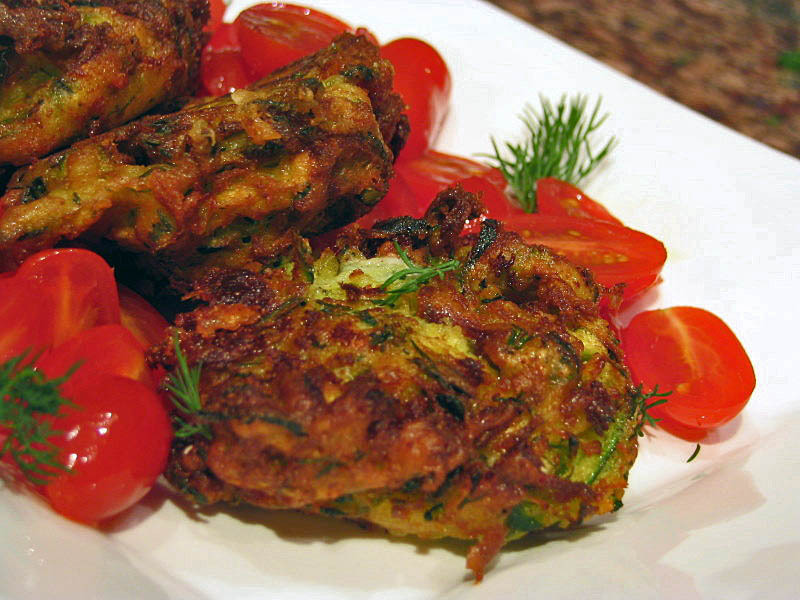 When finished frying, put them on absorbent paper and add some salt to taste. Now, close your eyes, and dream of a tropical beach, coconut trees, a hammock, and perhaps a refreshing “caipirinha” with your mandioca frita!